The swimming pool is still, a lone leaf skittering across its mirrored surface. In the ballroom, the ghosts of glamorous couples fox trot and waltz out onto the verandah. Listen carefully in the empty bowling alley, and you might hear the whispers of those who crowded in here when it was a Japanese internment camp. 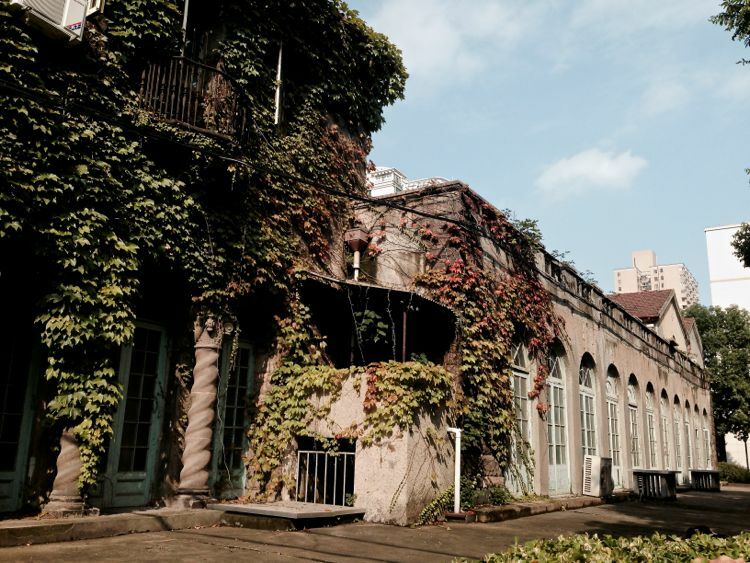 You won’t find the Columbia Country Club on any modern map, but the beautiful buildings of the onetime social hub for Shanghai’s American community still stand. 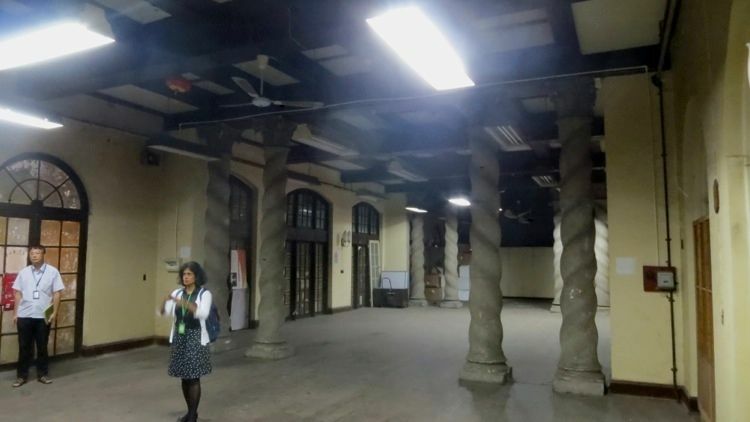 Though empty now and closed to the public, the doors were recently unlocked for Historic Shanghai, thanks to the kindness of an introduction by historian and author Greg Leck. The Columbia Country Club, 1939. The Columbia Country Club, 2014. 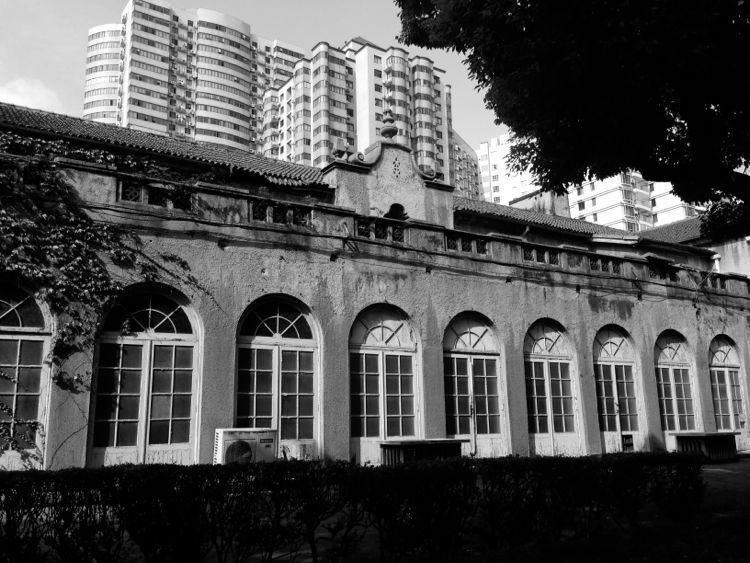 The club for Americans was founded in 1918 on Route Doumer (Donghu Road), but when it outgrew its premises in the 1920s, Asia Realty Company acquired five acres of farmland at 301 Great Western Road by Columbia Road (Yan’an West Road by Panyu Road) and hired Shanghai’s pre-eminent American architect, Elliott Hazzard, to design the buildings. He set his timeless Spanish Revival buildings amongst two fields, and the club’s facilities included tennis, an outdoor swimming pool, a bowling alley, ping pong, and (of course!) baseball. 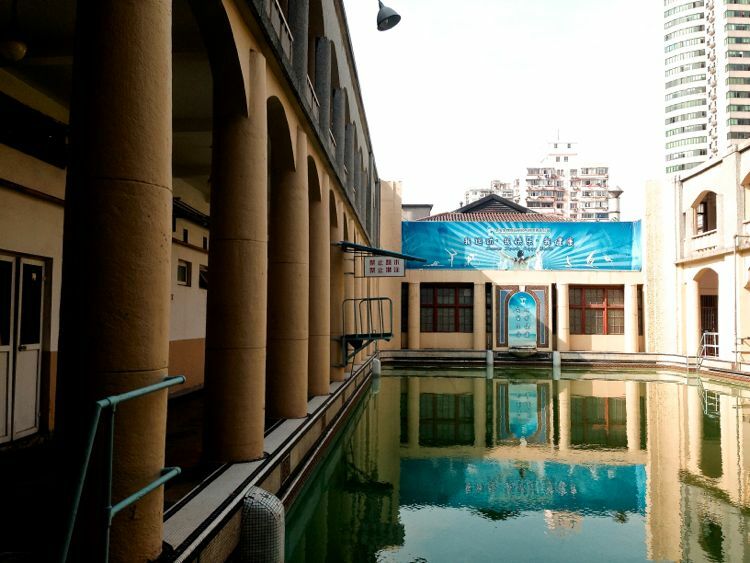 Located on one of the Extra-Settlement Roads outside the International Settlement, it was some distance from downtown: “This country club is really in the country,” declared the All About Shanghai guidebook in 1935. The club was, however, located close to the Columbia Circle residences, also developed by Frank Raven‘s Asia Realty, with many of the socially prominent Columbia Circle residents also members of the Country Club. 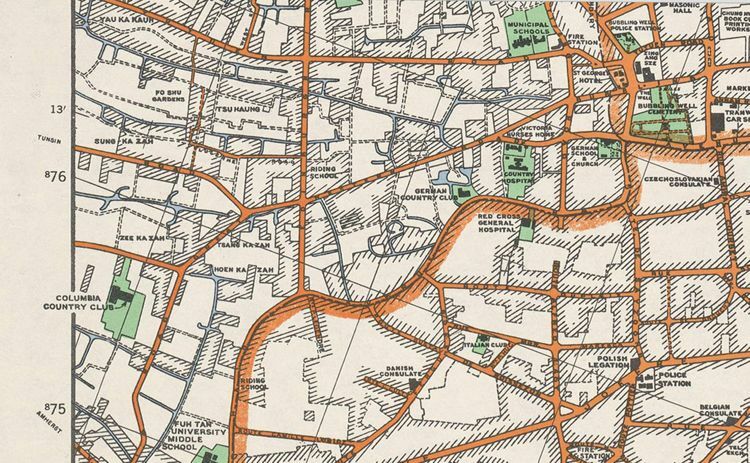 1933 map showing Columbia Country Club, “really in the country”. “The Club is particularly attractive in the summer, with a spacious verandah,” noted one guidebook. The front of the Columbia Country Club today, with overgrown foliage obscuring the portico and main entrance. The Columbia Country Club swimming pool. The photo may date from 1943, when it was a Japanese internment camp and drained due to lack of chemicals. The Columbia Country Club’s swimming pool, today. 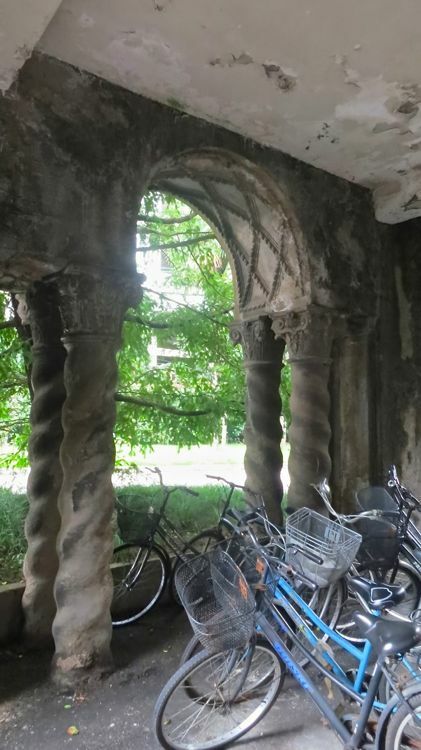 It was used in the summer months by the employees of the Institute that occupied the property from 1951-2014. Today it is filled up, and guests can dine poolside – but not swim. 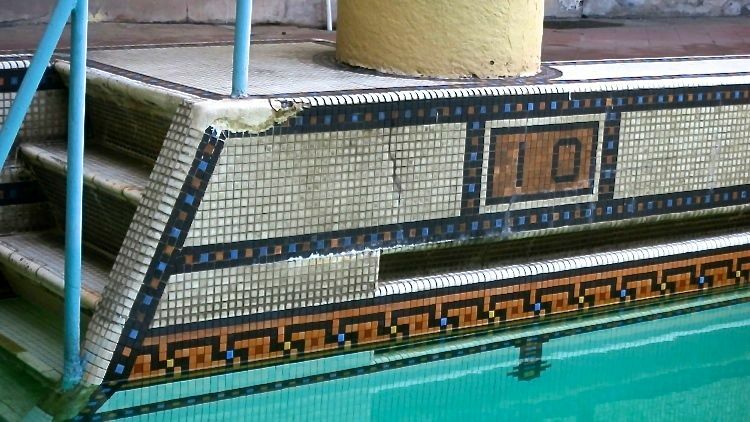 Beautiful original tile, indicating depth – perhaps this is where young Johnny jumped in to make his “depth bombs”? The Red Dog Cotillion at the Columbia Country Club. Photo: courtesy Patricia Luce Chapman. Parties like the “Red Dog” Civil War party would have been held in rooms like this one. 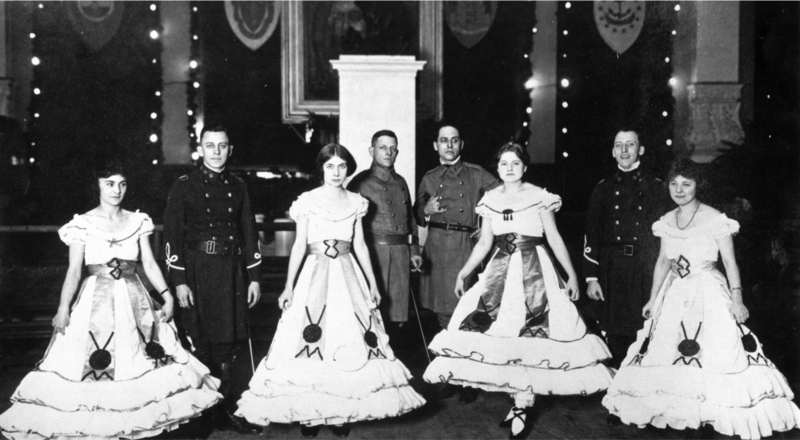 Like the “Red Dog” party, American themes were popular at the Columbia Country Club: an orchestra played American dance music and the club was well known for its’ July 4th barbeque. No wonder, then, that the club’s logo featured the American “stars and stripes”, using 13 stars for the original 13 colonies. The logo of the new Columbia Circle development is a simplified version of this original logo. 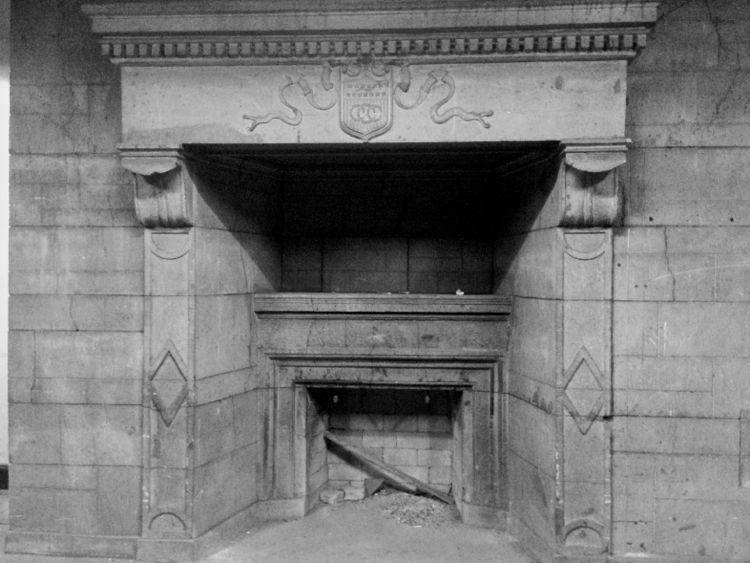 Columbia Country Club logo on the fireplace. The Columbia Country Club logo featured the American stars and stripes. Chapman continues, “After lunch―I usually had American-style hamburgers smothered in catsup and ice cream, our parents collected us, found Ah Ching [the family driver] and we drove the few blocks home.” Ah Ching would have picked them up at the portico [below], with its beautiful columns (and not jammed with bicycles! ), at the main entrance. 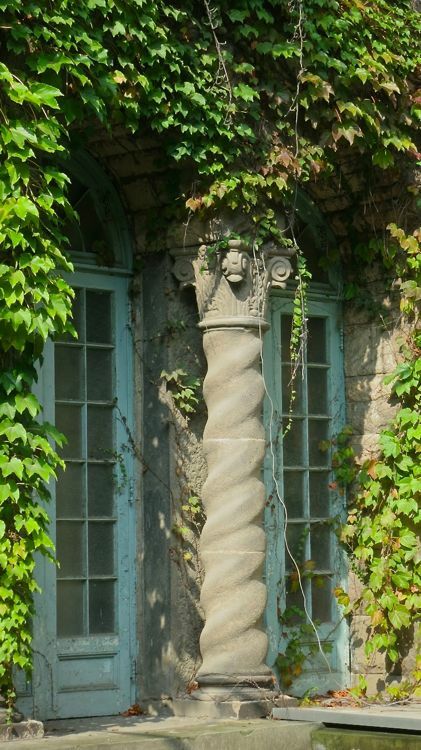 Club members would have been picked up and dropped off at this portico, with its beautiful columns. Like many clubs of its time, the Columbia Country Club also included rooms for male members, on an upstairs floor. These rooms, and, indeed, the rest of the club, took on a very different function after 1942, when the U.S. entered World War II with the bombing of Pearl Harbor. The Japanese took over premises and the club was used first as a transit camp Allied nationals awaiting repatriation. By 1943, the Columbia Country Club had become the Great Western Road internment camp; 386 people were interned in total. It would never function as the Columbia Country Club again. Ironically, one of the internees in the Great Western Road camp was Elliott Hazzard, the man who had designed these very buildings as a palatial retreat. Hazzard would later be transferred to Lunghwa Camp, where he died. 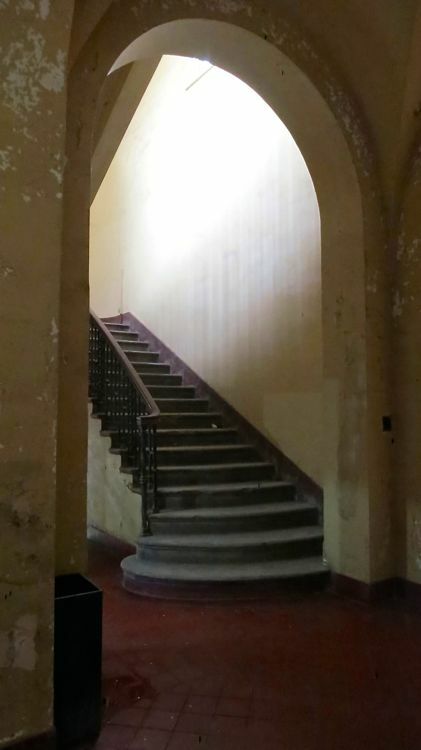 The staircase leading up to the member accommodation. The Club also had a second building which housed a bowling alley, billiards room, dining room, locker room and conservatory. 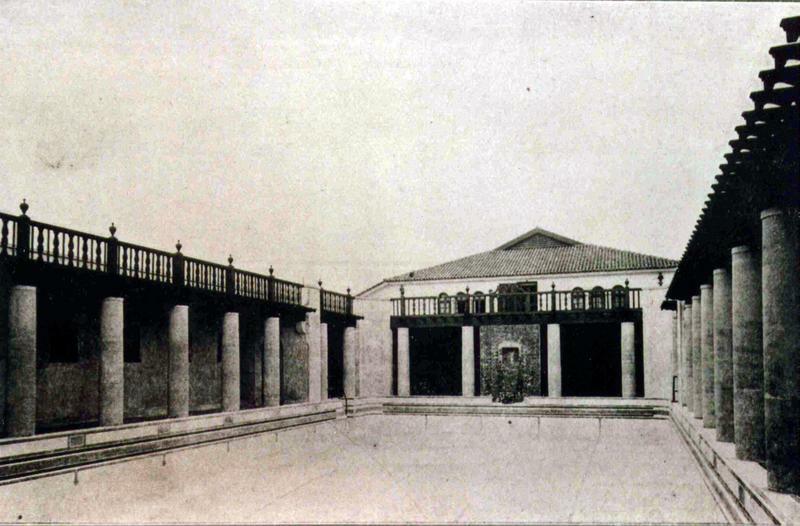 In Captives of Empire, Greg Leck recounts that “seventy-five beds were placed in the bowling alley, but the alley gutters caused problems, as beds could not be always be placed without having two of their legs in a gutter.” Today, this building and the swimming pool are referred to as the “Navy Club”, alluding to the postwar period when the U.S. Navy used the premises. An adjoining building housed the bowling alley and other facilities. 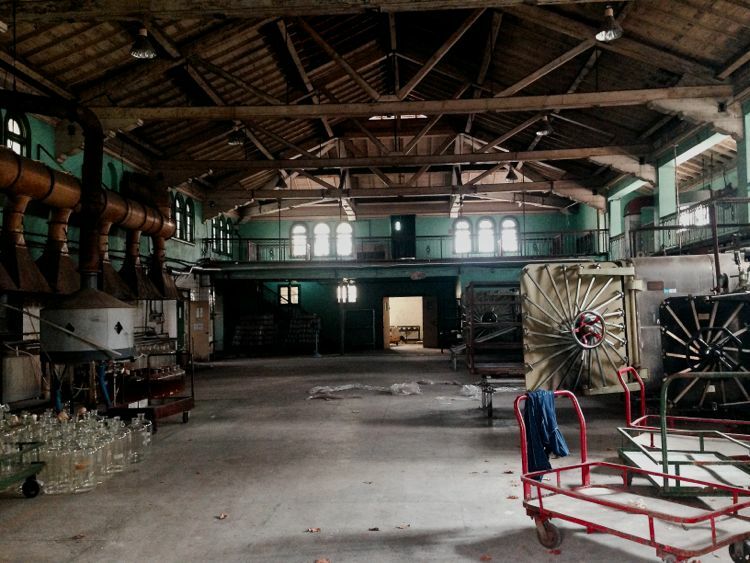 The interior of the building that housed the bowling alley and later became an internment camp. The spectator’s gallery above was also used as sleeping quarters. 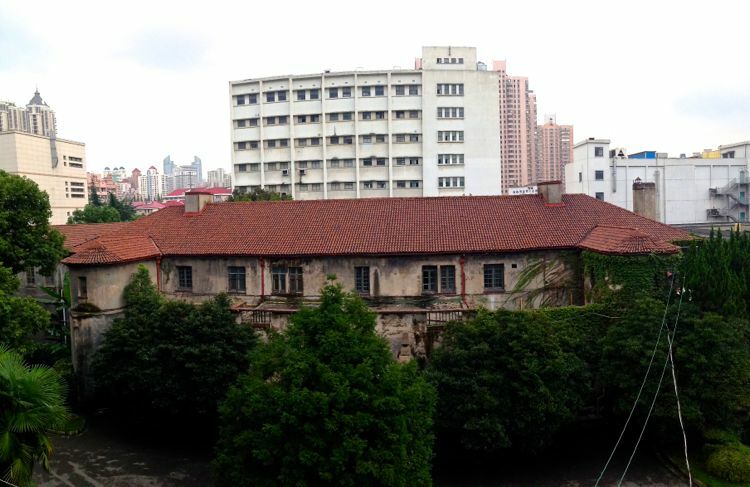 Today, the Columbia Country Club is part of the Shanghai Institute of Biological Products, which occupied it from 1951-2014. 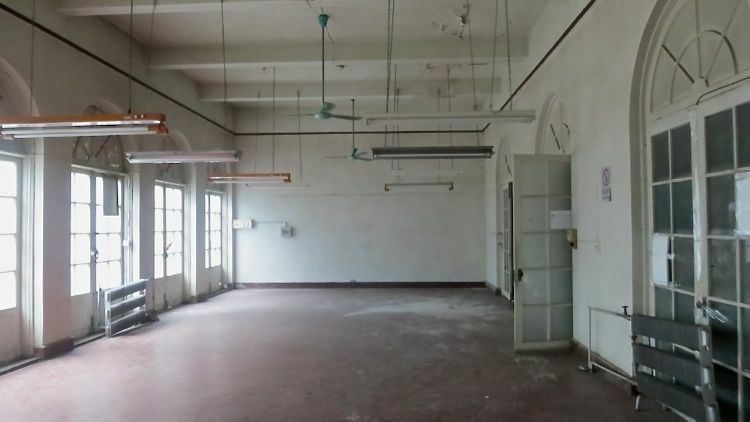 It was used as office space for many years, but now it sits empty – prime for a tenant with a sense of history to bring it into the future. Chapman, Patricia Luce. Tea on the Great Wall: An American Girl in War-Torn China. Earnshaw Books, 2015. Johnston, Tess and Deke Erh. 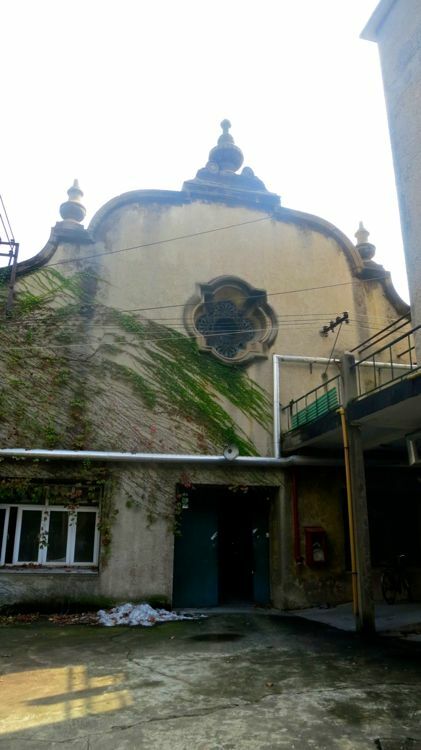 A Last Look Revisited: Western Architecture in Old Shanghai. Old China Hand Press, 2004. Johnston, Tess and Deke Erh. Frenchtown Shanghai: Western Architecture in Shanghai’s Old French Concession. Old China Hand Press, 2000. Leck, Greg. Captives of Empire: The Japanese Internment of Allied Civilians in China, 1941-1945. Shandy Press, 2006. Nenad Djordjevic, Old Shanghai Clubs & Associations: A Directory of the Rich Life of Foreigners in Shanghai from the 1840s to the 1950s. Hong Kong: Earnshaw Books, 2009.